Built by Henry Williams, shortly before or after his marriage to Georgiana Weems in 1868, Linden has been the home of either a lawyer or judge since its existence. The land upon which Linden sits was patented in 1747 as Williams Hardship and the first known owner of the land was Thomas F. Moore who remains obscure. The building site is a gentle, southeast facing slope. The building’s original form was a two-store T plan with rear-ell. A rough stone foundation supports the earliest section. Framed and weather boarded, Linden’s transformation architecturally in 1906 to a two-story double pile, central passage plan with a rear two-story ell and one story flat-roofed front porch was accomplished by John B. Gray, Sr. A rear shed-roofed porch and pantry were also added. 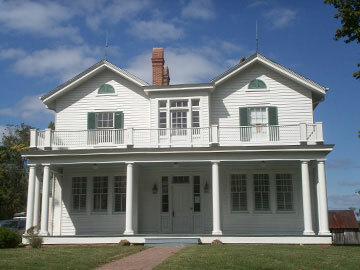 The colonial revival front porch has a balustraded roof supported by Doric columns. Linden is unique as a near town farm complex consisting of the dwelling and early outbuildings. The early outbuildings include a wood house, chicken house, ice house, smoke house, poultry house, two corn houses, a barn for cattle and horses, a stable and a garage or carriage house. Most of these buildings remain in various stages of decline. The outbuildings do retain much of their original materials and construction techniques to be of interest to scholars and architectural historians. The Calvert County Historical Society, Inc. proposed moving its headquarters to Linden and operating its research library, museum shop and exhibits of Calvert County history from this centrally located, historical site. In addition to the historic qualities of the site itself, Linden provides the public with a greatly expanded opportunity to learn and enjoy the County’s history. Through on-going programs and expanded hours, native and visitor alike will be able to visit the facility, use the library, view recordings, examine original documents, enjoy the large collection of materials and share in the county’s cultural heritage. The extensive holdings of the society will have proper archival storage and fire protection.